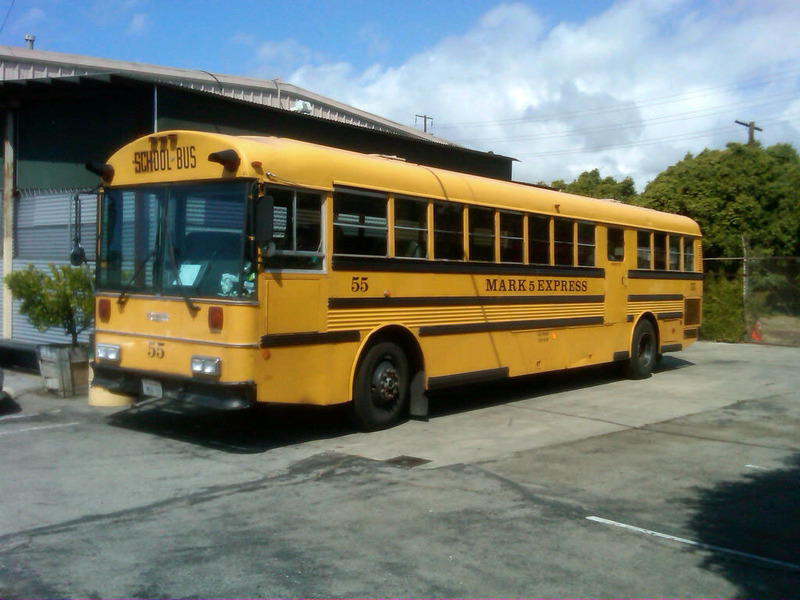 The sight of a big yellow school bus reminds me of field trips. From elementary school forward, growing up in South Pasadena, I went to many museums and galleries. These ranged from the Southwest Museum in nearby Highland Park to the old Los Angeles County Museum of History, Science and Art. Now I find myself on the other end of the story. Here at the gallery, we often host school groups, college students, and adult education classes. Some students are just kids, some are middle aged, and we’ve often hosted a van from a retirement home. 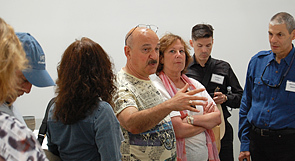 We also provide (free of charge) lectures, artists’ talks, and exhibit walk-throughs. Many museum groups from out of town come to see our shows. We even coordinate tours for those groups. Is this all about commerce? No, it’s a public service: free arts education. Today we welcomed a class on “The Fine Art of Art Collecting” taught by Edward Goldman, a host of the show Art Talk, on KCRW. His dozen students got to spend quite some time looking closely at our show of new work by Jennifer Lee, while learning about her background and artistic process. 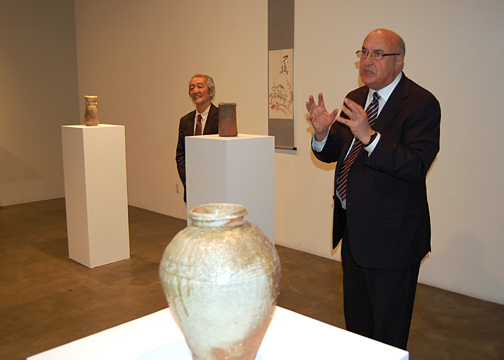 Another example of the educational nature of the gallery is the short lecture given by Robert Singer in February, at the opening reception for Sugimoto Sadamitsu’s exhibition. Mr. Singer is a well-known expert in Japanese ceramics, and his knowledge was extremely helpful in explaining the subtleties of the shigaraki and iga styles in which Sugimoto-sensei works. Galleries provide a much-needed educational resource, and many teachers and professors use the gallery as a teaching venue. We welcome the visits from USC, UCLA, Loyola, Santa Monica City College, Crossroads, and dozens of other schools. Our artists are also on the faculties of several major universities, including UCLA and Cal Berkeley. Here at the gallery, we really believe in the value of an education that includes the fine arts. I’m happy that, through the gallery, I’m able to make this kind of experience and knowledge accessible to the general public. On Saturday, July 14th, we celebrated Jennifer Lee’s fourth solo exhibition at the gallery with an opening reception. I was happy to welcome Jennifer and her family back to Los Angeles – they had made the long trip from London for the occasion. We were joined at the reception by the British Consul-General, Dame Barbara Hay, who had never seen Jennifer’s work but was immediately taken by it. Dame Hay, along with Jennifer’s other fans and collectors were happy to have the opportunity to hear from Jennifer directly about her artistic process. 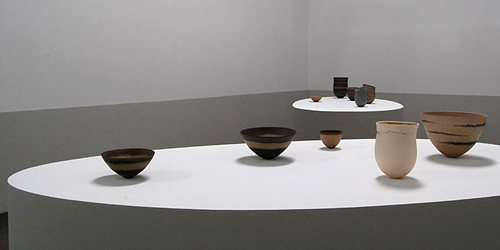 For this show, Jennifer had requested two large, egg-shaped plinths on which she could arrange her vessels in small groups. I feel that this enhances her work, as it creates beautiful negative spaces between the pieces, allowing them to speak softly to one another. Her work begs to be examined from every direction, and the plinths allowed the crowd on opening night to spend time shifting their perspectives and discovering the subtle details that characterize Jennifer’s style. The exhibition Jennifer Lee: New Work will run through August 11th, and I hope that some of you will get a chance to come by and see it for yourself! Here at the gallery I’ve recently had the chance to take a closer look at a wonderful work by Adrian Saxe that I haven’t seen in quite some time. Sacred and Profane is a garniture from 1973, and was included in LACMA’s 1994 survey of Adrian’s work titled The Clay Art of Adrian Saxe. These days, Adrian is known to many as an artist who combines technical mastery of his material with a whimsical interpretation of historical decorative arts traditions and a provocative sense of humor. It’s amazing to see how these qualities were present in his artistic practice over forty years ago, and that his work from that period still maintains its freshness and fun. This garniture consists of twin vessels in porcelain, with incised and painted glaze decorations, as well as gold luster banding. 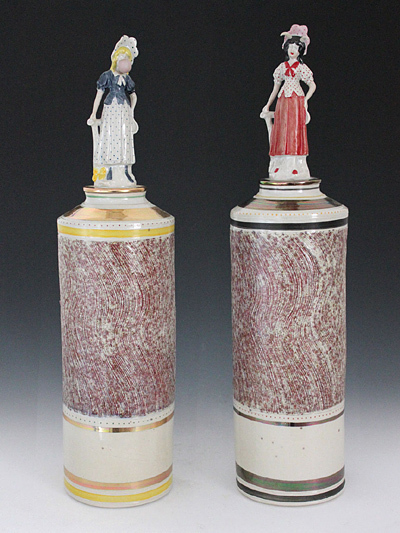 Atop each vessel stands the figure of a girl, charmingly dressed in skirts and matching bonnet. The innocence and preciousness of these ladies is cunningly subverted however, as one sports devil’s horns while the other blows an enormous bubble with her pale pink chewing gum. 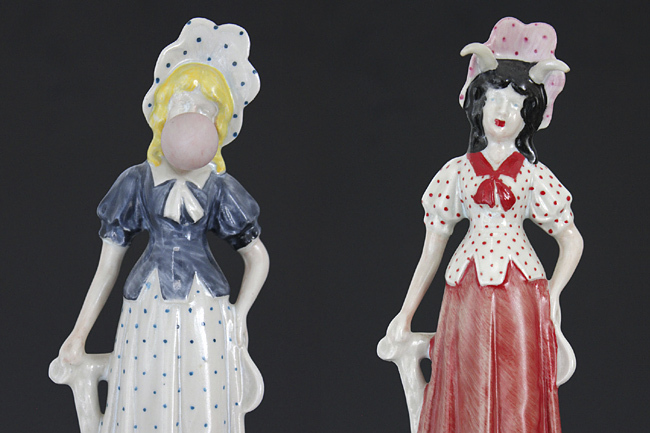 The title provides a natural question – which of these girls is sacred, and which profane? It’s also possible that Adrian is drawing an equivalence here between the two. This of course only opens the work up to more questions. If gum-chewing is analogous to devil’s horns, does the piece function as a playful indictment of gum or an illustration of the banality of horns? It’s entirely likely that these questions will never be resolved, and they probably aren’t intended to be. Adrian often seeks to provoke as well as entertain his audience by mixing the academic with the irreverent. A big part of putting together Sensual Mechanical: The Art of Craig Kauffman involved tracking down and identifying a huge number of images. Craig’s art was of course our first priority, but we also wanted to include exhibition announcements, catalogues, installation views, and archival photographs in the book. These types of objects and images represent an important part of Craig’s story, and the story of the Southern California art scene he participated in. The photographs in particular illustrate the cultural history of the period, and work to contextualize Craig and his art for the reader. It wasn’t always easy to get these photos though, and I am particularly grateful to Craig Krull and his staff for all of their help. Craig Krull Gallery possesses a wonderful archive of photographs, and their expertise meant we were often able to identify images that we had very little information about. This turned out to be a real life-saver for us, because we wanted to provide proper credit to the photographers who took the pictures we’re using whenever possible. 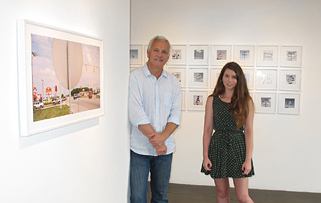 Craig Krull and Kelly Prather helped us distinguish between the works of numerous photographers, and the gallery also graciously granted us the right to reproduce several images. The photographs we’ve gathered for our upcoming monograph on Craig Kauffman add a lot of character to the book, and I’m so happy we were able to include them. I really can’t thank enough everyone who helped in this endeavor by contributing, identifying or discovering the images that make it so special. Again, many thanks go to Craig Krull and his team for their efforts on our behalf, we really appreciate all of their help. At the gallery, we hold an average of ten exhibitions a year, presenting the work of West Coast and international artists. 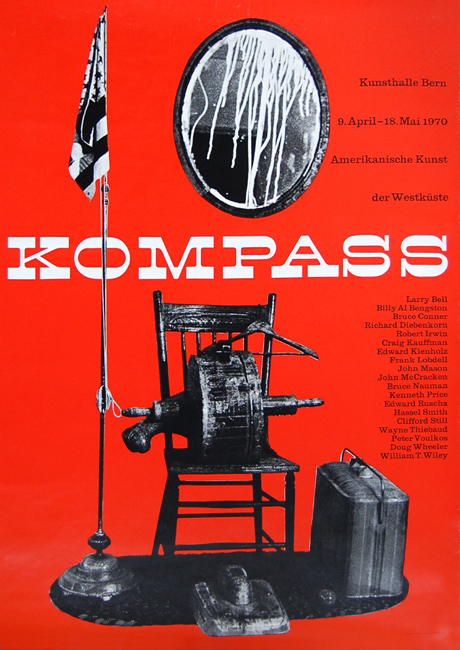 These shows are held in the three main rooms of the gallery, and are a mix of solo and group exhibitions that may explore certain themes, materials, or ideas. However, a part of the gallery that is sometimes overlooked by visitors is the presentation room. Here, we feature a variety of artworks that are not part of the major exhibits. These pieces are diverse in style, size, and material, and give a fuller picture of the artists represented here. They are also frequently rotated to showcase a greater number of artists and keep visitors coming back to see what’s new. 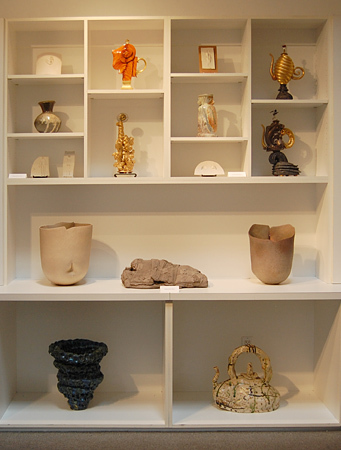 Right now, we have on display drawings and a sculpture by Larry Bell as well as ceramics and sculptures by Adrian Saxe, Robert Graham, Sugimoto Sadamitsu, Svend Bayer, Richard DeVore, Satoru Hoshino, Georges Jeanclos and Goro Suzuki. The presentation room also has a small viewing area, where visitors are invited to watch one of the documentaries we have, including The Cool School and Revolutions of the Wheel: The Emergence of American Clay Art. We have also begun producing video interviews with some of our artists, and these will be available for viewing. I like to use this space to continue to raise awareness for the artists, even when they are not the subject of an exhibition at the gallery. It’s fun to improvise here, switching out works and watching how they affect visitors and the other pieces of art they are displayed with. I sometimes find relationships between works that might not have occurred to me had I not combined such a disparate collection of pieces.